A couple years ago, my cousin read on my other blog how much I enjoyed learning about Laura Ingalls Wilder when I reviewed a couple books for the LIW Reading Challenge. She asked me if I would be interested in reading the Pioneer Girl manuscript. OH BOY! I promptly replied I would. You see, Pioneer Girl is the autobiography of Laura Ingalls Wilder, and at that time it was just an unbound, two hundred page document. LIW first wrote this autobiography on lined paper in 1930, with the intention of publishing it. Laura's daughter Rose typed the manuscript and used her contacts as an author to seek a publisher. It was not to be then. Laura's fans often contact the Herbert Hoover Presidential Library to obtain a manuscript of her autobiography which later was edited and written for an audience of children. 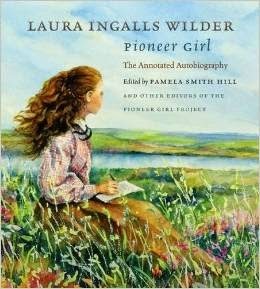 Now, LIW fans anticipate the arrival of the published Pioneer Girl: The Annotated Autobiography. (Affiliate link.) Obviously, it's written by Laura Ingalls Wilder; it is also co-authored by Pamela Smith Hill. Currently available for preorder, Pioneer Girl will be published on November 20, 2014. Consider reading more about how it finally was accepted for publication in this article. The Pioneer Girl manuscript is a typical manuscript, complete with spelling errors and words X'd out as it was typed long before word processors. I'm grateful to my cousin for sharing it with me. Pioneer Girl is not a rough draft of any of the Little House books. Instead, it is more like LIW's memories, good and bad, of growing up. 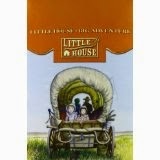 Consider it all of the Little House books abridged into one lengthy journal. At times Pioneer Girl includes more information than the books; other times, the books provide additional details. Most of the stories she wrote of made it into her books, but remember, they are considered historical fiction. I found the manuscript to be rather fascinating. I enjoyed it because I knew it was fact-or at least to the best of her memory. A few stories were too harsh and dark to put in the children's books. My biggest surprise was to learn that during The Long Winter, the Ingalls family actually housed a man, his wife, and their child because they had no where else to go. The man promised to pay them back (and did), but because they were boarders, they did none of the work. Remember the grinding of wheat and twisting of hay that could never stop? The Ingalls family did it all. They also gave up some of their portions for the woman because she was nursing the child though the husband never shared. I can imagine some people might be quite surprised that Pa and some other fellows took the law into their own hands. I was not. It was a different time and a place, without law in the land. Laura was certainly a shy girl, though very intelligent. Her writing, even in unpublished form was very much like her writing in the books. She is rather factual instead of emotional. I am grateful to have been able to read Pioneer Girl, the unedited version of Little House! Though not written for children, the reader understands the love and hard work that made the Ingalls family who we know them to be. I definitely recommend Pioneer Girl: The Annotated Autobiography for adult fans of Little House. In my opinion, it contains a few scenes not intended for young eyes. If you share it with a child, please be prepared to read and discuss it together.